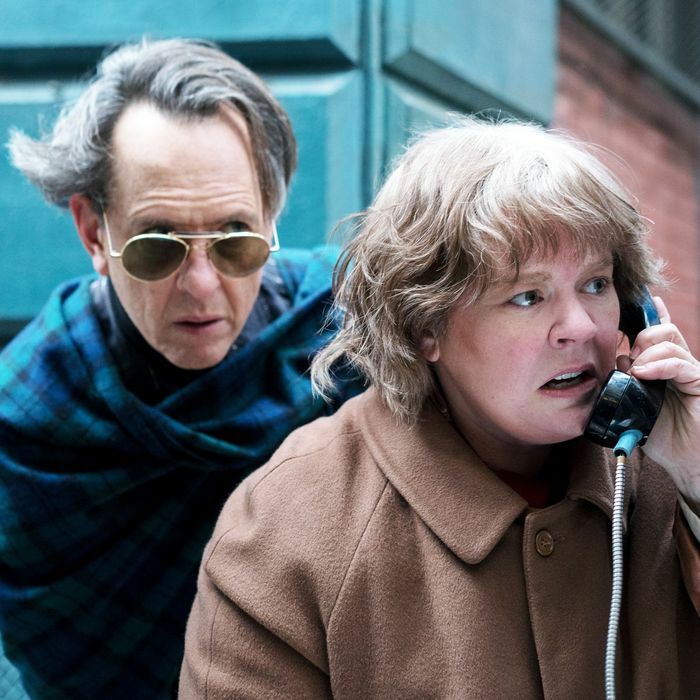 There is a moment so revolting, so sad, and so utterly unforgettable in Can You Ever Forgive Me? that I won’t give away, but is one of the most visceral depictions of loneliness I’ve seen in a while. Loneliness, onscreen at least, tends to be a vibe, a #mood, a way of looking off into the distance as a certain kind of melancholy tune plays. In Nicole Holofcener and Jeff Whitty’s screenplay, it’s a physical reality, a stench you live with until you are both used to it and loath to escape it. Holofcener, a writer attuned to minute details of life rarely addressed but immediately recognizable, turns that skill to Marielle Heller’s adaptation of celebrity biographer Lee Israel’s memoir/confessional of her brief but thrillingly reckless career as a forgery artist. Melissa McCarthy, frumpified to 1991 proportions, plays Israel, a writer who has staked her career on the fabulous lives of the people she’s written about and is still anonymous and struggling to find work. Her agent (Jane Curtin) won’t answer her calls, and her current project, a biography of vaudeville star Fanny Brice, is not exactly the hottest property on the market. She’s months behind on rent, and her cat, the only living being she seems to not harbor some barely veiled loathing for, is sick. While researching in the archives of the New York Public Library, she finds a letter from Brice tucked away in a file, and sneaks it out to see how much it will fetch at the local bookshop. It turns out a slip of paper written on by the right person can be worth at least its weight in $20 bills, but when Lee has the brilliant idea to embellish the letters with her own typewriter, and then start completely fabricating her own, the price quadruples. The title takes its name from one of Israel’s most notable forgeries, a letter supposedly from Dorothy Parker. Lee prides herself on being, in some ways, “a better Dorothy Parker than Dorothy Parker,” and there’s some sense of alienation in that pride, and in the career of a woman whose job it is to know the lives and quirks of luminaries with enough clarity to make them re-packageable to the larger public. The skill with which she taps into the inner souls of her famous subjects seems to be in equal proportion to her inability to form bonds in everyday life, in a way the film never directly comments on but which McCarthy feels fully attuned to. Lee forms a begrudging friendship with Jack (a lovely and heartbreaking Richard E. Grant), a fellow outcast from the New York hoity-toity literary set who is in all likelihood worse off than she is. Her need for him in her forgery operation, i.e. her career, is convenient cover for her need for him as a human being. Elsewhere, Lee begins to form a halting romance with one of her buyers, played by Dolly Wells. Countless stories about a flawed protagonist’s secret life building a wall against human connection have been told before, but I found something uniquely true and sad about Lee and Anna’s courtship, because it seems to come from real need from both of them, and is thwarted not so much by the lie of the forgeries, but by Lee’s own inability to accept the affection Anna is so willing to give. In one date scene, Heller tells an entire story out of eye contact and nonverbal gestures; it’s incredibly intelligent emotional filmmaking. That’s where the unexpected pleasures of Can You Ever Forgive Me — which could have been an intensely miserable film — sneak in. What is on paper a small-time heist film in the vein of the Coen Brothers or Breaking Bad is ultimately a cover for a more observant and relatable portrait of loneliness. In an age where the viability of a writer’s life is in even more ignoble decline, and where finding alternate lines of work or otherwise “faking it” become a necessary last resort, Israel’s story feels like a highly empathetic cautionary tale. Can You Ever Forgive Me? was nominated for a 2019 Oscar in the following categories: Best Actress, Best Supporting Actor, and Best Adapted Screenplay.